The analysis of single cell gene expression across thousands of individual cells within a tissue or microenvironment is a valuable tool for identifying cell composition, discrimination of functional states, and molecular pathways underlying observed tissue functions and animal behaviors. However, the isolation of intact, healthy single cells from adult mammalian tissues for subsequent downstream single cell molecular analysis can be challenging. 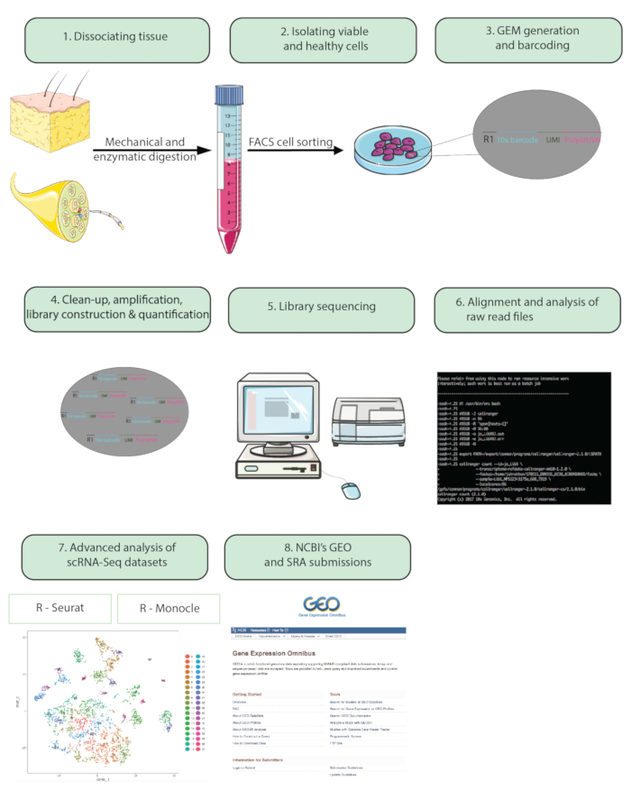 Researchers from the University of Calgary describe the general processes and quality control checks necessary to obtain high-quality adult single cell preparations from the nervous system or skin that enabled subsequent unbiased single cell RNA sequencing and analysis. Guidelines for downstream bioinformatic analysis are also provided. Steps from whole animal preparation to analyzing single cell RNA-Seq datasets to submitting final datasets to a publicly available repository. Gel beads in Emulsion (GEMs) refer to beads with barcoded oligonucleotides which encapsulate thousands of single cells.